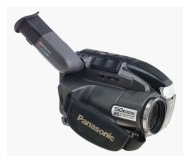 alaTest has collected and analyzed 37 reviews of Panasonic PV-D209 Palmcorder Camcorder. The average rating for this product is 4.5/5, compared to an average rating of 4.0/5 for other Camcorders for all reviews. Reviewers are impressed by the durability and portability. The image quality and usability are also mentioned favorably, whereas there are some less positive opinions about the battery. Comments are divided on the zoom. We analyzed user and expert ratings, product age and more factors. Compared to other Camcorders the Panasonic PV-D209 Palmcorder Camcorder is awarded an overall alaScore™ of 76/100 = Good quality. alaTest has collected and analyzed 14 user reviews of Panasonic PV-D209 Palmcorder Camcorder from Amazon.com. The average user rating for this product is 4.5/5, compared to an average user rating of 3.9/5 for other Camcorders on Amazon.com. People are impressed by the price and battery. The durability and usability also get good feedback. Affordable, Reliable, Easy to operate, Panasonic Quality! Panasonic PV-D209 is a great camcorder. WE bought this over a year ago. We had a house fire, and we wanted to buy the camera to record the progress of our house being redone. The Panasonic VHS-C Palmcorder: Still a good value? With the advent of digital camcorders, the typical consumer may be wondering if an analog camcorder is still a worthwhile purchase. If you're talking about a lower end Panasonic VHS-C, I'd have to say absolutely. A Lifetime Of Memories for Only $450! The Panasonic PV-D209 is a quality videocamera for the price range it is offered in. My wife and I received this camera as a gift when our first child was born and it has performed admirably ever since. I bought the Panasonic PV-D209 because we wanted a camcorder to film our children growing up. This the best camcorder for the money. Especially if you are on a budget. It is simple to use, and compatible with your current VCR. Panasonic's PV-D209 is the perfect choice for great home videos without a lot of fuss. A sharp color viewfinder gives a true representation of your subject, and a 26x optical zoom and 150x digital zoom provide great flexibility. Panasonic's Digital Electronic Image Stabilization compensates for shakes and jiggles, and the full-size head system produces high-quality images in an easy-to-use VHS format. The PV-D209 also features MotionSensor technology, which initiates recording when motion is detected, and Color Digital Fade for more creative transitions.